This came out of a Piloted Sky Golem for me in Wild, and then hit it with Lantern of Power and it perfectly went around a Deathlord twice for lethal. As of MSG, this, Whirling Zap-o-matic and Al'Akir the Windlord (and Raging Worgen? Does it count?) are still the only decent Windfury cards in the game. 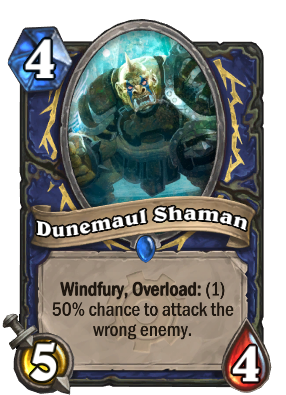 I understand Windfury can be a powerful effect, but is it that hard to make playable Neutral Windfury? Grotesque Dragonhawk, Windfury Harpy and Grook Fu Master can all be destroyed by a spell half their cost, Flying Machine does far too little damage and Thrallmar Farseer is just on the edge of playability. Can hit minions with Stealth. I dont know why but the only way to use this card is to face with it with no other minions on the board. Sadly this is one of the few usable shaman class cards. Do you know if i silence it after first attack it still could attack second time? No after attacking once, it counts as 1 attack (redundant i know sorry), so when you silence it, it has no windfury, therefore no 2nd attack. One of those cards that cannot go unopposed. Shaman has recently gotten a lot of cards that make them go narrow instead of wide. Between this, the Whirling Zap-o-matic, the Fireguard Destroyer and the good ol' Unbound Elemental, there is a deck that just builds massive threats every turn that need to be answered or matched. I agree with you. Clearly a underrated card with so much potential. If you think it's good, you need a way to justify it dying to Piloted Shredder and giving you overload. crackle and lightning bolt are not aoe. this is seems like a card that many tempo shamans will use. dunno if its standard to run 2 though. I ended a game in 1 turn from 30 health thanks to this card. The 4 health bothered me at first too but you just have to learn how to keep it safe usually you can hide it behind a taunt and then just kill anything on the board the next turn that could kill this card. I'm sure you could also find a deck build that could easily keep this card buffed to 5 health. I wonder if 4 health makes him unplayable in constructed. I guess he'll usually trade for a card at worst, but 5 health would be better. It's just too easy for things to die at 4. Yeah this card won me two games by itself. One game I hit for 16 and the other 20. In all the games I lost this card died fast.